[By Nick] Welcome to Nick Week! I’m starting up college again and I thought this would be the perfect time to unload a bunch of backlogged reviews that I have before I lose my thoughts completely with business type knowledge. What better way to start off this week than with a BANG!! Well, BANG!! Ice Cream that is. Remember when I got that huge shipment from Chocolate Shoppe? Well they included their whole BANG!! line of flavors. I’ve been meaning to post this for a while but yeah, better late than never. While not the most appealing sight at first, there’s a nice aroma coming off this one. It’s reminiscent of a Reeses cup which is always a great start. Coincidentally enough, the base tastes like a slightly darker version of a Hershey’s bar. It’s not the most sophisticated of chocolate flavors but it has that nostalgia factor. The flavor is way better than what Ben & Jerry’s offers. I’m guessing the dark chocolate qualities are coming from the added caffeine. The peanut butter ripples add a bit of saltiness but the peanut flavor gets drowned out by the chocolate base for the most part. 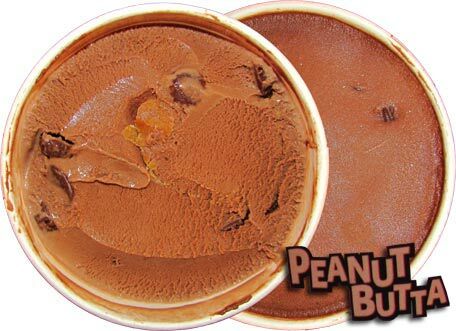 The real peanut butter flavor lies in the mini cups throughout the pint. Thankfully BANG!! isn’t shy with them either. Almost every spoonful included one of those cups, adding a burst of peanut butter to every bite. When combined with the base, this flavor tastes remarkable like a dark chocolate Reeses cup. Seeing as those are my favorite from the Reese’s line, this ice cream is definitely a winner for me! Now it's time for a word of warning: I don’t normally consume things with caffeine. As you could tell, I really enjoyed that ice cream and ate most of the pint in one sitting. I would highly advise against that. An hour or so after I started getting really tense and my heart was beating extremely fast. I could’ve sworn I was seeing things out of the corner of my eyes but there was nothing ever there. After this stopped and my body basically crashed, I had a pounding headache for the next two days. Caffeine affects people differently and I’d imagine since I have no real tolerance to it, my experience was more of an extreme occurrence. That said, I’d still recommend that you just eat one serving at a time when trying this brand. That was one of the worst feelings I’ve ever had and wouldn’t wish it upon anyone else. This flavor is everything you'd expect it to be. The espresso base is more on the bitter side with a slight bit of milkiness to it. 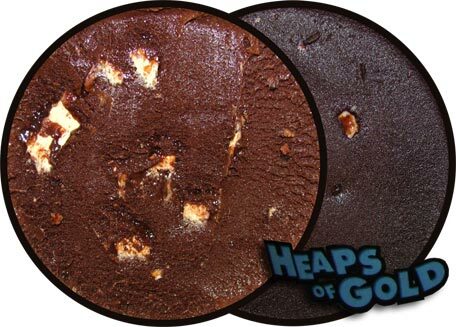 That bitterness is only enhanced by the fudge swirl and chocolate chunks. The interesting thing is that the bitterness from the base helps the milk chocolate sweetness to come through more from the mix-ins. The fudge swirl is an actual fudge swirl and reminds me of something you'd get from a Moose Tracks flavor. The chocolate chunks are just your average chocolate mix-in. They’re nothing out of the ordinary or of note to speak of. However, I'm glad they chose to go with regular chocolate instead of espresso chocolate chunks because that might've made things too overpowering on the bitterness. This one I'll have no problem eating a serving at a time. 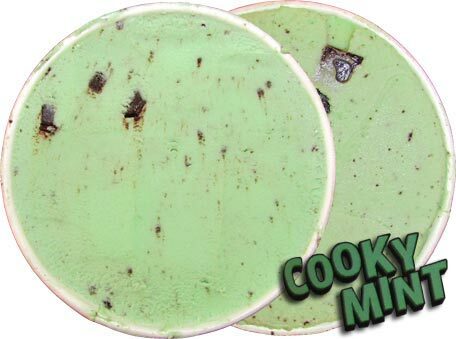 If Iced Latte-Da was the safest choice, Cooky Mint might be the scariest of the bunch. Not only does the name bug me but I'm not too sure how the bitterness I've been experiencing with the first two pints will translate here. I have however had amazing experiences with their cookie & cream type flavors from their Chocolate Shoppe line so here's hoping we keep on with that. Welp, as you can see from the picture above, enjoying a great CnC experience won't be the case. The sandwich cookies are sparse and not all that big either. The mint base is actually really good though. There's no apparent bitterness from the caffeine that I was expecting. It's actually pretty mellow and leaning more toward an artificial mint flavor instead of the hybrid I had with their Mint Avalanche. If this one has a lot more cookies like the Chocolate Shoppe flavors, I could see me having a hard time putting this one down. As is, I think I prefer Babcock Hall's Mint C&C a lot more. My word, when they say deep dark chocolate ice cream, they mean it! That is by far the darkest looking ice cream I have ever encountered. Heck, it’s bordering on being pitch black. I’m not sure if I should be afraid but the pieces of toffee peeking out sure are a nice sight. The sight translates to the taste as well. The base isn’t so dark that it’s pure bitterness but it sure packs a punch. I can’t believe I’m about to say this but the flavor is darker AND better than Jeni’s Dark Chocolate. The ice cream even has the fudge like texture that Jeni’s has. While not mentioned in the description, there are little pockets of fudge like sauce that amplify that theme. The base alone would beat Jeni’s any day but BANG!! went and added my favorite candy, Heath bars, to secure the throne. The toffee is lacking its chocolate coating which is a smart move. The milk chocolate would’ve been rendered irrelevant by the dark chocolate base. This move also allows for the flavor of the Heath bars to shine through a lot easier. That added buttery nutty component works perfectly with the base. This makes me ask why no other company produces a chocolate based ice cream that includes toffee pieces? It goes so well together. If they were to include a caramel swirl, I’d be in heaven. Now my only complaint would be the added caffeine. I could easily devour this whole pint in one sitting but I learned my lesson last time. I’d really rather not go through all of that again. I guess it’s a blessing in disguise since I’ll be able to savor this pint longer. All in all, I’m glad I got to try out this brand. 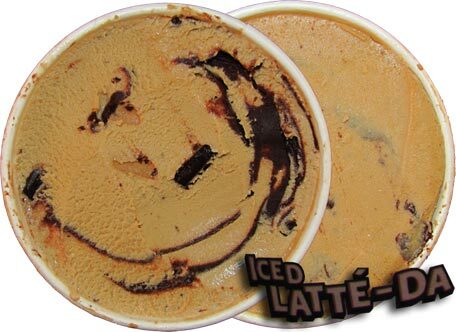 It’s not every day you see a caffeinated ice cream. With Dubba’s recent love of energy drinks, I could definitely see him enjoying these. As for me, I’m just not in the market for caffeine infused products. If Chocolate Shoppe would offer the Heaps of Gold and Peanut Butta flavors as non-caffeinated, I’d be all over them. 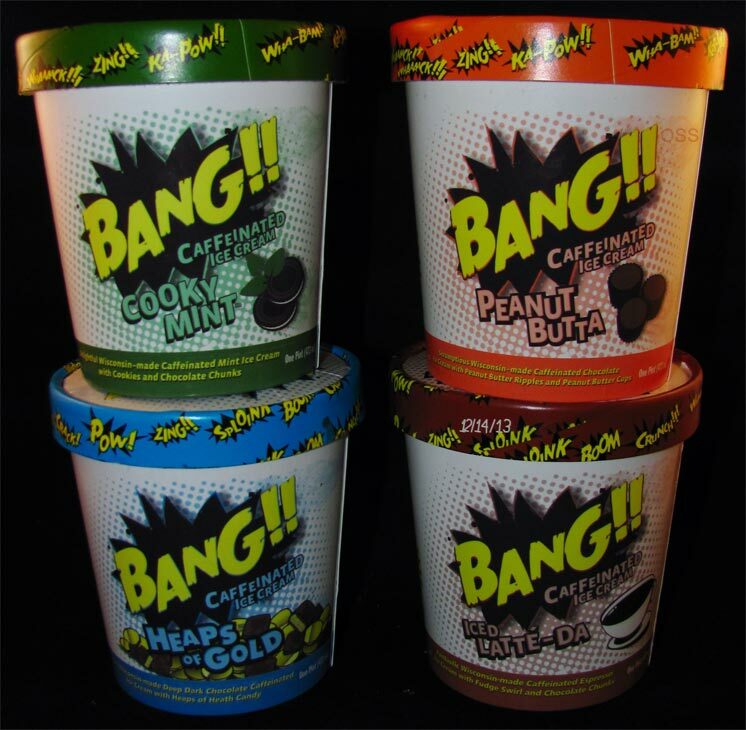 If you’re looking for an extra jolt from your dessert, look no further than BANG!! I love caffeine, but there's a time and place for it. I have never thought "man, if it's one thing my ice cream needs, it's more caffeine." Most people I know eat ice cream after dinner. Before bed. Who the f thought this was a good idea? Some of these look really good but I get a very similar reaction to caffeine when I have too much. I would definitely have had too much since it's really hard for me to have only one serving out of a pint I really like. I always admire how both you and Dubba can show such constraint with your ice cream portions! Good luck in school; hope you have a great semester. Keep us updated on how it's going! Khanh, we're big advocates for ice cream for breakfast so I guess these would work well there. Like all ideas, there's always going to be pros an cons. I commend Chocolate Shoppe for putting themselves out there and creating something unique. I'm just not in that target market. I looked it up on their website, it's 125mg of caffeine for a 4 ounce (on scoop) serving. That's quite a bit, especially for a product that's often served in the evening. Many folks eat two scoops ... I can see why you'd be overwhelmed by the jitters. cybele, I remember them advertising the ice cream as having the equivalent of one energy drink. That wasn't one of my greatest ideas to eat almost a full pint. Thankfully for those with a lack of self-control at times like myself, they do now offer the ice cream in single serve containers.